2013-2014 collection. Ardistia, utilising only high quality materials, one of them Maxistyle, combined with the latest techniques successfully enhances a woman's persona as well as fulfilling her desires and lifestyle." I'm falling in love with the skirt, the detail a bit like origami art! From her collections, I can say that the designs are perfectly suited for active and stylish women. Ardistia added a touch of elegance in every details. Effortlessly elegant! Just like the tittle. It is just me thinking that every man look good in a suit or maybe that's the truth ? Samuel Wattimena showed some textile variances in this collection. My favorite one is the first picture below! Reminds me with James Bond or Men in Black. 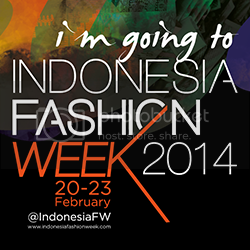 I came too to IFW on the first day and the last day! I like the men's looks from this fashionshow! Would you like to follow ech other via GFC? hey love your blog post !! Love the prints and neutral tones in the first collection.